Before the vamps, before the angels, before Lucy Blue, there were the witches of Falconskeep. When I was growing up, “good romance novel” for me meant nothing but “medieval romance novel,” preferably something with magic. I wanted a knight in shining armor with a big sword and a bad attitude; I wanted to identify with a powerful, magical woman with the brains and spells to fight back or hold on as it suited her. 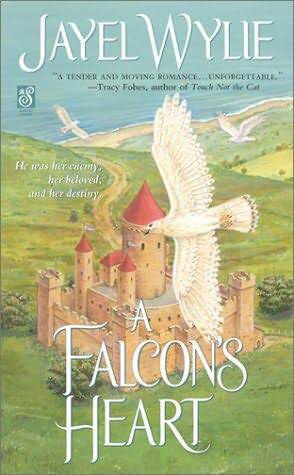 So when I grew up and got serious about writing romance novels of my own, that’s what I wrote – and thus the Falconskeep trilogy. 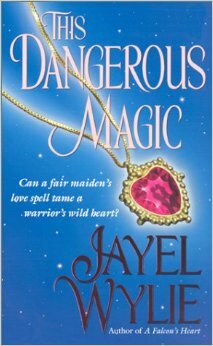 The first book, A Falcon’s Heart, got me my first ever solo publishing contract with Pocket Books/Simon & Schuster way back in 2001, and two sequels, This Dangerous Magic and Wicked Charms, followed in 2002 and 2003. If you’re old enough to remember and care, you’ll recall that e-books weren’t really a thing then; romance was all about the paperback. But now, finally, after literally years of me begging and pleading, Pocket has released un-ludicrously-priced E-book editions of all three, and I couldn’t be more thrilled. (E-book versions have been available off and on all along, but the prices were insanely high and/or wildly inconsistent; I felt bad even trying to promote them.) They’re $8.99 each, available from all the usual e-book outlets, and they’re pretty damned awesome if I do say so myself. A Falcon’s Heart: Alista has been taking care of her noble father’s household for most of her life as he has fought on the side of King Stephen in his bloody civil war. But when peace is made and her father dies, she is forced to marry Will, a close friend and ally of the new king. Will was born at Brinlaw, the castle where Alista lives; his own father built it then lost it in the wars. He is determined to reclaim it and bend this inconvenient but beautiful mistress-in-residence to his will. Grief-stricken and alone, Alista accepts him as her husband, and he resolves to make her as happy as he can. But their uneasy peace is shattered when evidence surfaces that Will might have had something to do with Alista’s father’s death. When he is called to court to answer this charge, Alista escapes Brinlaw and returns to the ruin of her mother’s castle at Falconskeep. In this haunted place, she discovers powers she never knew she had and a magical past that could bring her closer to this maddening knight she loves or tear them apart forever. This Dangerous Magic: Malinda Brinlaw is a witch. She is the daughter of Lord William and Lady Alista Brinlaw, favorites of King Henry II, and she has inherited her mother’s faery magic. But unlike her mother, she glories in her powers, often recklessly, leading her parents to send her away from the royal court and the schemes of Queen Eleanor for her own protection. Tarquin FitzBruel is the half-brother of Malinda’s cousin, Nan, a warrior and pirate recently returned from the Middle East for Nan’s wedding. When Will asks him to stay at Brinlaw and look after Malinda, Tarquin knows he should say no. His mother told him when he was a boy that he was the spawn of a demon, forever damned, forever possessed, and everything he has done and felt since has convinced him she was right. But he has seen visions of Malinda before he meets her, and her willful nature attracts and infuriates him as no other beauty could. And when Malinda sees Tarquin, she knows he is destined to be hers, and she will use any power she has, including her most dangerous magic, to have him. Wicked Charms: Aiden Brinlaw is an anomaly of every kind. His best friend since childhood is Prince John, the evil usurper everyone else hates. And he is a wizard, the first male ever in his mother’s ancient faery line to inherit the Falconskeep magic. John sends him to the highlands of Scotland to secure a castle there, promising that if he is successful, he can marry John’s little sister, Katherine, a favorite of King Richard. But when Aiden reaches Glencairn, he finds Evelyn, the beautiful Scottish betrothed of his dead predecessor, living there with her son, Max. Evelyn is smart, warm, and kind, but she’s hardly above using her feminine wiles to secure a home and title for her son. She is determined to make this English newcomer her husband and to make Max his heir. Aiden, who must marry the princess to have the castle at all, is equally determined to make the lovely Evelyn his mistress.Their battle of wits and wills unlocks not only their hearts but an ancient curse far more powerful than petty politics and empty promises, a connection to an ancient supernatural race that once ruled the lands around Glencairn and could return to destroy them forever.